Fast delivery. With the product purchased is fantastic. Can't bet the price. Saved about 850. 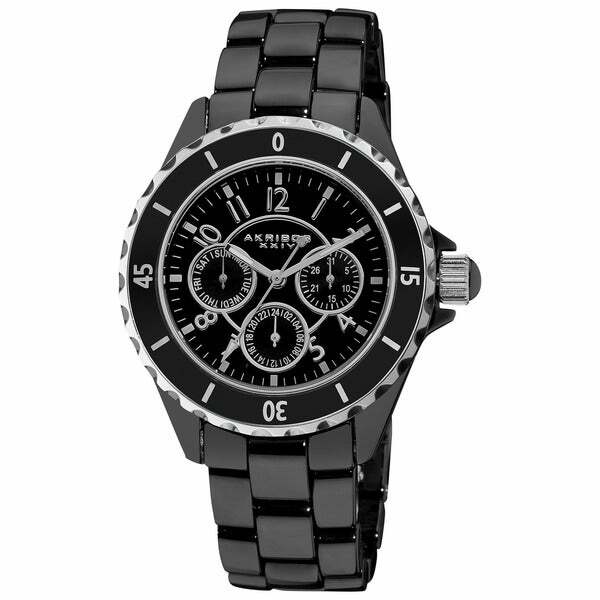 Silver luminous hands set against a black multifunction dial highlight this stylish Akribos XXIV ladies watch. This women's watch is crafted of ceramic and includes three subdials featuring the day, date, and GMT. Dimensions Case measurements: 39 mm wide x 39 mm long x 11.75 mm thick. Bracelet measurements: 18 mm wide x 8.5 inches long. With the exception of the weight of the watch, I LOVE everything about this watch! It is my current favorite! I collect watches and truly love this watch! Beautiful watch, but it does not have GMT, only a 24-hour dial that is directly connected to the main face. Need to correct the description. Beautiful expensive looking watch at an affordable price! Way too big .... not like what they says... disappointed ! I like the black wrist band and the black dial. I have never owned this brand and thought I would try it. "The product description says the bracelet length is 8.5 in long, can it be resized down to 6.5 in long?" Yes, this product can be resized to 6.5 inches.